The long term goal of the project is focused on the redistribute of laboratory reared Samurai Wasp across regions of NYS where BMSB is present and causing damage to agricultural crops. As populations of the Samurai Wasp are redistributed over time, they will develop and increase in number on each farm and in each neighborhood where they are placed. 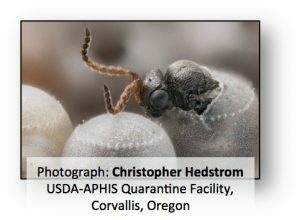 Over time they will begin to reduce populations of brown marmorated stink bug (BMSB) populations simply by killing the eggs that BMSB produce. Samurai wasp use BMSB eggs to reproduce and in this way increase their own populations. We anticipate sustainable biological control by the Samurai to provide an overall reduction in the injury BMSB causes to vegetable and tree fruit crops, while significantly reducing home infestations. The overall result being a dramatic reduction of insecticide use in NYS to manage this pest. As man made dwellings, office buildings and homes harbor overwintering populations of BMSB, there will always be pockets of BMSB in these overwintering locations. Redistribution of Samurai wasp in rural, suburban and urban setting will provide direct access to these non-agricultural locations where BMSB can arise from homes every year. This is especially important during years when the forest dwelling stink bug are unable to overwinter successfully to survive cold temperatures. We are requesting that NYS residents (tree fruit, vegetable growers, homeowners…) interested in releasing Samurai Wasp on their farms and neighborhoods send an email request to ek538@cornell.edu using the subject heading “Samurai Wasp Redistribution” . * The eggs will arrive in petri dishes with zip ties for attaching to tree branches. Upon receiving the eggs, growers will place the eggs in clusters of woodland tree hosts of brown marmorated stink bug. These include sugar maple, white ash, wild cherry, tree of heaven, staghorn sumac along with many other species found on the BMSB Host Plants page on the Stop BMSB web site. You are encouraged to send this along to other growers you may know that are interested in the project.